Scrapbook Paper 8" x 8"
Home Page › Heritage Scrapbooking › Scrapbook Paper 8"x8"
Family Matters - Family Tags - 8"x 8"
Family Matters - Family Defined - 8"x 8"
Family Matters - Family Home - 8"x 8"
Family Matters - Family Life - 8"x 8"
Family Matters - Family Moments - 8" x 8"
Family Matters - Family Tree Transparency- 8"x 8"
Papermania - Bexley Black Paper Pack 8"X8"
Papermania - Lincoln Linen Paper Pack 8"X8"
Better than trimming down your 12”x12” papers, this collection gives you bordered papers and all-over patterned papers (some with shading around the edge of the sheet), plus tags, alphabet tiles and art perfectly sized for a smaller page. Of course, you’ll also have sample page ideas to inspire you too! 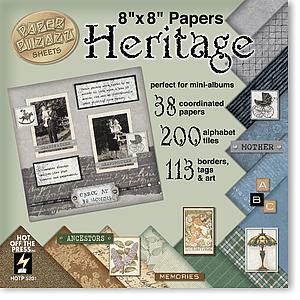 And yes, our Heritage paper is appropriate for a variety of historical eras, and works for both masculine and feminine photos. Whether you are reminiscing about a family reunion, tracing your ancestry or just savoring special family traditions, the Family Theme Paper and Punch-Out Tablet from Deja Views will complement family photos of all ages. The 8" x 8" Family Papers and Tablet combine traditional colors with lovely patterns of stripes, paisley, fleur-de-lis and argyle. 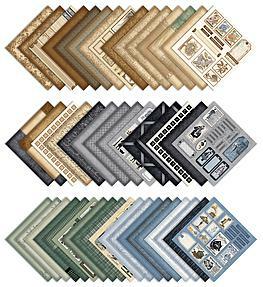 Creating a meaningful family album is fast and easy with over 300 elements in the Family Paper and Punch-Out Pieces Tablet.